If you are searching “palm tree trimming” “palm tree trimming near me“, “palm tree trimmers near me“, “palm tree service“, “palm frond removal” or “palm tree trimming services“, Arbor Care Tree Care can help! Brown or yellow palm tree leaves are an eye sore! We provide residential and commercial palm tree trimming in Phoenix, Arizona to help keep your palm tree trimmed properly! Please give us a call today at (480) 797-5566. Schedule palm tree trimming by giving Arbor Care a call today at 480-797-5566. The leaves of a palm tree are referred to as fronds, and when they begin to turn brown they can be a sight for sore eyes. 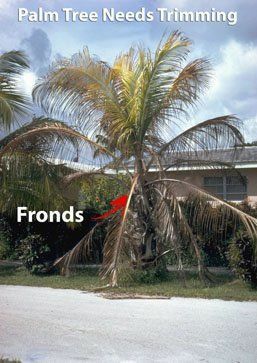 The fronds (leaves) will eventually start to die off, turning brown, yellow, or even an orange. Are you wondering if there is something the matter with your palm tree or concerned that it could be dying because its fronds (leaves) have started changing colors? Well, you can stop worrying right now, for this is a normal and natural part of your palm trees growth. However, you probably don’t want to see trees that appear to be dead in your yard, and that is where Arbor Care comes into the picture. Arbor Care provides professional trimming services for your palm tree(s), and they are experienced and capable in removing the palm fronds (leaves) from your palm tree(s) when they have come to the stage of their growth that they start turn brown, yellow, and sometimes orange. It is essential to have these colored fronds (leaves) trimmed for the health of your palm tree(s), This allows them to grow new fronds, otherwise the bad fronds (leaves) will take all of the nutrients from the rest of the tree. We use a 4 – step trimming process for palm tree(s), which ensures that our workers are safe, and it also ensures that our customers are going to be satisfied with our work. First, we are going to assess the tree(s) in question, to be on the safe side, for it lets us know of any dangers we need to be on the lookout for. We are going to give you a free palm tree(s) estimate up-front, for you to approve before beginning the work. Once you have approved the quote from the free estimate, we will get started. When we are finished with the palm tree(s) trimming, we always make certain that we have cleaned-up any debris and waste from your property. You will be able to see palm trees all over in places like Phoenix, Arizona where there are such hot climates, they are on the side of the roads, in public parks, at shopping malls, and on the freeways. They need to be kept trimmed if you want to have a beautiful appearance for they grow rapidly, getting out of control. The services of palm tree trimmers can help to keep your palm tree(s) beautiful all through the year. Here at Arbor Care tree service can help in keeping your palms safe from insect infestations, being under fertilized, and free of diseases. Checkout the services we provide for palm tree trimming below. There are several palm trees that will shed their own dead fronds, and will not need to be trimmed. These will be the royal palm trees, veithchia, and the fox-tail, Although, even these are going to need to be fertilized and also require nutrients to stay healthy. The benefits that one will receive from having their palm tree(s) cared for by a professional tree trimming service will be in watching your palms live a long and healthy life. A palm tree that is poorly cared for is going to be seen by others as an unhealthy looking tree, for the lack of proper care will only result in the trees loss of health. Schedule palm tree trimming in Phoenix by giving Arbor Care a call today at 480-797-5566. We also offer palm tree trimming in Tempe, Mesa & Scottsdale. If you are searching “palm tree trimming” “palm tree trimming near me“, “palm tree trimmers near me“, “palm tree service“, “palm frond removal” or “palm tree trimming services“, Arbor Care Tree Care can help!